Cruise Ship Captain is a computer simulator and a learning tool allowing you to explore how a Captain or Harbor Pilot can maneuver the cruise ships. You are given a Bridge window that controls ship. If you are piloting the “standard ship”, you have twin engines, a set of bow and stern thrusters and twin rudders. With the azipod-driven ship, you control a unique propulsion and steering system consisting of a pair of pods that carry the propellers. Your challenge is to bring the ship to the dock in the harbor of your choice. Harbors include Southampton, New York, Fort Lauderdale, Long Beach, Honolulu, Nawiliwili, Apia and Sydney. The help file or operation manual is available at any time by pressing F1. You also get a small photo album showing each of the harbors. On the other hand, Cruise Ship Captain is a game that encourages you to compete with others or yourself on how skillfully and how quickly you can bring your ship into the harbor. After mastering the introductory level of difficulty you can increase the challenge by requesting variable wind speeds up to 100 knots, harbor traffic and even random equipment failure. A special version of Cruise Ship Captain called Cruise Ship Time Trials is included in the package. It differs from Cruise Ship Captain in having a count-down timer. You set the amount of time allowed the player, 5, 10 or 15 min, and the game halts after his or her time is up. When it halts it displays the players score that includes damage from any collisions. The “standard ship” uses the classic ship design of twin, shaft-mounted propellers that are mounted in front of twin rudders. In general, the propellers drive the ship forward and in reverse and the rudders control the direction. With forward thrust, the propellers increase the steering power of the rudders by driving water over their surfaces to form a water jet to either side. You can steer the ship with either the rudder or the propellers. The ship also has bow and stern thrusters to help turn the ship or push the ship sideways toward or away from the dock. The ?Pod ship? has the most modern propulsion design with a pair of ?azimuthing pods?. Propellers are mounted on pods that hang below the ship. Electric engines in the pods drive the propellers. The pods can rotate 360 degrees thus eliminating the need for a rudder, the pods both drive and steer the ship. When the pods are rotated to 90 degrees they act as powerful stern thrusters that can work along with the bow thrusters. 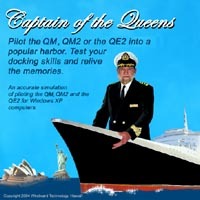 Captain of the Queens is a computer simulator and a learning tool allowing you to explore how a Captain or Harbor Pilot can maneuver the Cunard ocean liners. You are given a Bridge window that controls ship. If you are piloting the QE2, you have twin engines, a set of bow thrusters, a single rudder and 1 tug boat. The original Queen Mary has 4 engines and a single rudder and can use 2 tugs. The QM2 has a unique propulsion and steering system consisting of two pairs of pods that carry the propellers. The newest ships, Queen Elizabeth and Queen Victoria, have a pair or rotating pods. Your challenge is to bring the ship to the dock in the harbor of your choice. Harbors include Southampton, New York, Fort Lauderdale, Long Beach, Honolulu, Nawiliwili, Apia, Southampton and Sydney. The help file or operation manual is available at any time by pressing F1. You also get a small photo album showing each of the harbors. Captain of the Queens is also a game that encourages you to compete with others or yourself on how skillfully and how quickly you can bring your ship into the harbor. After mastering the introductory level of difficulty you can increase the challenge by requesting variable wind speeds up to 100 knots and even random equipment failure. A special version of Captain of the Queens called Queens Time Trials is included in the package. It differs from Captain of the Queens in having a count-down timer. You set the amount of time allowed the player, 5, 10 or 15 min, and the game halts after his or her time is up. When it halts it displays how far the player was from the dock or, if docked, the amount of time it took to dock. Cunard’s classic ocean liner, the Queen Elizabeth 2, is the first ship in this simulation. The QE2 uses the classic ship design of twin, shaft-mounted propellers that are mounted in front, and to either side, of a single rudder. In general, the propellers drive the ship forward and in reverse and the rudder controls the direction. With forward thrust, the propellers increase the steering power of the rudder by driving water, albeit indirectly, over its surfaces to form a water jet to either side. You can steer the ship with either the rudder or the propellers. The ship also has 3 bow thrusters to help turn the ship or push the ship sideways toward or away from the dock. The Queen Mary was the fastest ocean liner of her time with 4 propellers. She has but a single rudder for maximum speed efficiency, but this also places limits on her maneuverability. She lacks both bow and stern thrusters and is very difficult to bring in to the dock without the use of tugboats. You can, however, turn the ship and mimic the actions of a stern thruster by using the two outboard-most propellers against each other. The Queen Mary 2 was built with an entirely different propulsion system. Instead of propellers on shafts, she mounts her propellers on pods that hang below the hull. An electric engine inside each pod drives the propellers. Two of the pods, the outer-most, are fixed but the more amidships pods are ?azimuthing? and can rotate 360 degrees. This lends a very high level of maneuverability. 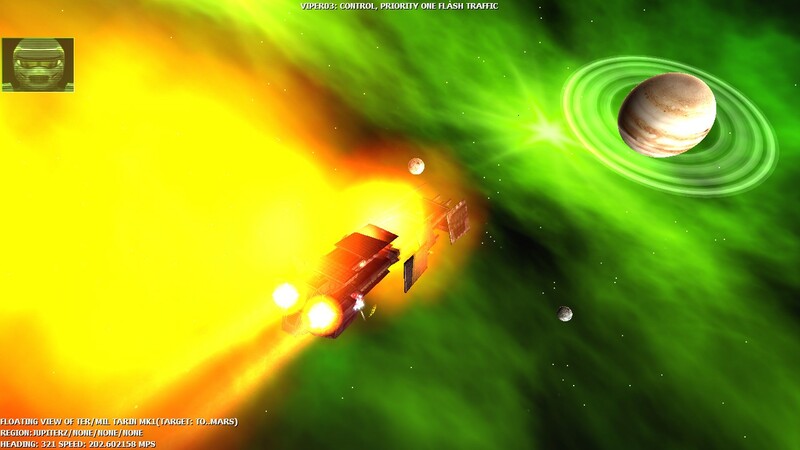 The pods can also act as powerful stern thrusters. The Oakflat PWR Nuclear Power Plant Simulator is a 32-bit program designed for Microsoft Windows XP (sp2 or higher) / Vista / Windows 7 that simulates a pressurized light-water nuclear power plant. The user controls the settings for the control rods, primary and secondary coolant pumps, damage control teams, and emergency actions to maximize the amount of electricity generated and profits earned. And be sure not to meltdown the core and cause a catastrophe in the process. The simulator can also be operated in a variety of automatic modes with the computer setting the controls based on the reactor output. The user can gradually take over control of the plant as they learn how to handle the controls on their own. There is even a Target Output control that works like an accelerator pedal, allowing the user to concentrate on the larger picture of running the plant and letting the computer moderate the atomic reaction in the reactor core. Oakflat was designed to be enjoyed as game and not as real scientific device. It was built using actual nuclear physics formulas, power plant designs, and nuclear reactor user manuals, mostly available from NRC and the internet. Features Include: * Simulates a 1.5 GWe pressurized light-water nuclear reactor and adjoining power plant. * Control the reactor and the plant using the keyboard and/or the mouse. * Interfacing with an intuitive and colorful interface that is easy to learn and use. * Users can enter settings such as control rod settings, coolant pump rates, damage control, reactor scrams, and more. * Users can allow the computer to control the simulator or they can input control values using a variety of methods. * Refueling places spent fuel rods in wet storage for cooling before moving them to long term storage in storage casks. * A Results screen gives the users feedback in both financial numbers and time/days to evaluate their performance. * The simulator can operate at 3 speeds and can be paused at any point to prevent the user from being overwhelmed. * A log file keeps a detailed summary of all the events of the simulation for later review. * Audio feedback with predefined alarm sounds or speech mode with the simulator speech. * Free upgrades to registered users for the life of the product … No upgrade fees ever! Universe of LIFE illustrates the 3D reproduction behavior of microorganism. Idea of the game is, to let beautiful graphic forms and surprising shapes originate from as simple as possible initially-patterns in the following generations. 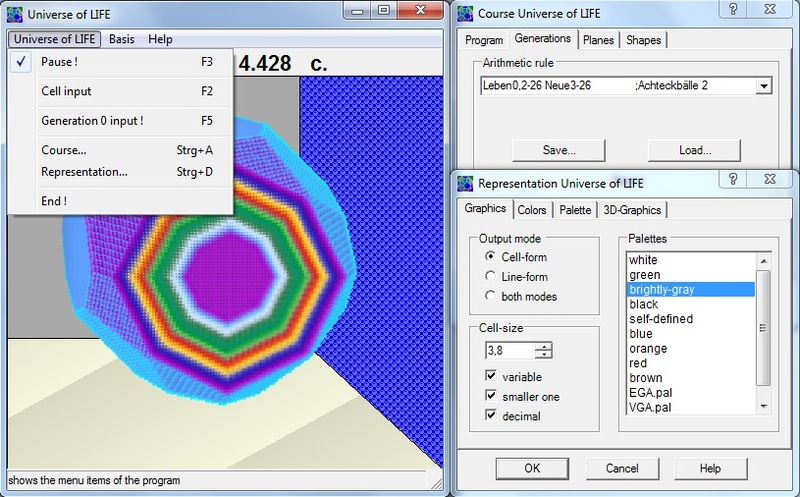 To this, Universe of LIFE offers you comfortable support: the graphic dialog-side offers possibilities about the output-mode, the color-palette or to vary the cell-size. The generations dialog-side enables to determine the incremental width and minimum-time of the indicated generations and the arithmetic-rule itself again. You can let originate with the inputs of the shape dialog-side through a multiple change of the arithmetic-rule within a course complex microorganisms or can look for new, remarkable arithmetic-rules. In the colors- and palette-dialog-side, the color-like look of the generations is influenced for the game-course. To this you experience closer details over the context-help in the dialog-forms (? – key or F1-button), or over the content-button in the help-application. You can manipulate also the current generation: to this you simply choose “cell-input” in the Universe of LIFE menu or press the F2-key and place the cursor with the mouse or the cursor-buttons on the game field-position that you would like to alter. By activity of the left mouse-button or the enter-key, an existing cell is removed at this position or a new cell is born in an empty-field. The input-plane becomes selected with the mouse-wheel or with the a- and s-button of the keyboard. In the status bar, the cell-coordinates are shown for additional control. jk-ware Universe of LIFE Theater is a playful PC application with forms of microorganism. Each form can be re-sized to display at the full screen resolution, or they can be arranged in a side-by-side format or in other overlapping or stacked formats. The selected arrangement can be saved to the later recall as configuration. Idea of the game is, to let beautiful graphic forms and surprising shapes of microorganismen originate from as simple as possible initially-patterns in the following generations. 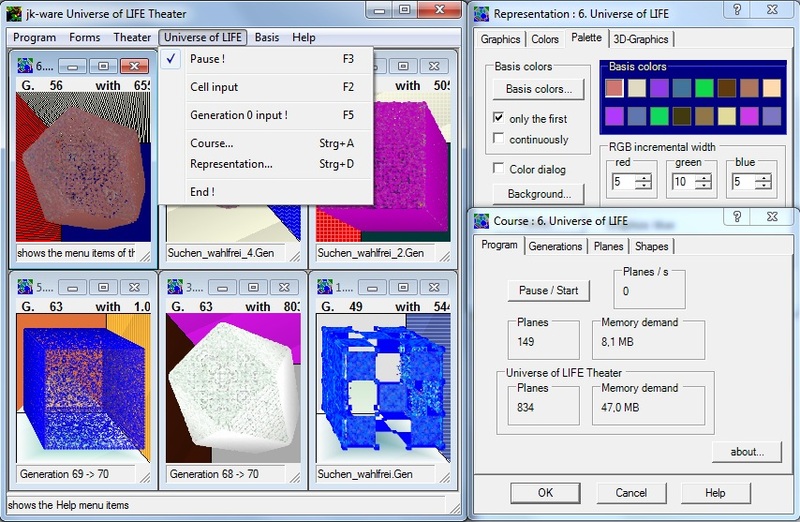 To this, Universe of LIFE offers you comfortable support: the graphic dialog-side offers possibilities about the output-mode, the color-palette or to vary the cell-size. The generations dialog-side enables to determine the incremental width and minimum-time of the indicated generations and the arithmetic-rule itself again. You can let originate with the inputs of the shape dialog-side through a multiple change of the arithmetic-rule within a course complex microorganisms or can look for new, remarkable arithmetic-rules. In the colors- and palette-dialog-side, the color-like look of the generations is influenced for the game-course. To this you experience closer details over the context-help in the dialog-forms (? – key or F1-button), or over the content-button in the help-application. You can manipulate also the current generation: to this you simply choose “cell-input” in the Universe of LIFE menu or press the F2-key and place the cursor with the mouse or the cursor-buttons on the game field-position that you would like to alter. By activity of the left mouse-button or the enter-key, an existing cell is removed at this position or a new cell is born in an empty-field. The input-plane becomes selected with the mouse-wheel or with the a- and s-button of the keyboard. In the status bar, the cell-coordinates are shown for additional control. Color LIFE figures the reproduction behavior of microorganism. The reproduction rules can be free selected likewise the incremental width and output time of the generations. Color-palettes can be produced by your own. With a shape-run, new rules and nice graphics can be found. The generations become also represented with decimal cell-diameters smaller than one and with a color-median value. For Windows CE is offered Color LIFE for different processors, that were not tested all by us. Please test Color LIFE with our test-version on your CE-device therefore beforehand. Perpetuum mobile realizes continually moving and rotating balls. With sound output originates such a music piece that proceeds from start until end in equally swift speed. Up to 500 balls jump in an area around. The ball movement can take place with gravity and impulsively. As spectator position can be selected the screen, the room middle, a ball or an elevator. Hereby special visual and acoustic effects come to the validity. The user can plan diverse attitudes with dialog pages. The further can be started a small reaction game or a screen saver in Perpetuum mobile. December 14, 2014 Games, Simulations, Software3000AD Inc.
Smoother, faster graphics and AI processing which results in better response at higher resolutions during lower frame rates. Improved space and planetary terrain rendering engines. Native support for 16:9 and 16:10 aspect ratio widescreen monitors with built-in support for 1280×720 (720p), 1680×1050 and 1920×1080 (1080i) resolutions. 111 Instant Action scenarios featuring various career modes. Game Builder System (GBS) which allows user created scenarios. It includes the source scripts to all scenarios included in the game. In a time of war, many are those whose story is never heard. In WWII the skies were, for the first time, a major battle-front. Many brave young people gave their lives, flying in tin cans filled with explosives and ammunition. This game is dedicated to the men and women on all sides who fought bravely in the service of their country. Air Conflicts is an arcade flight simulator game set in World War II, featuring the aircraft of this period and historically inspired missions. The emphasis is on intense dogfights, daring bombing raids and exciting aerial missions. Real campaigns and real battles with focus on the gameplay. Easy control over aircraft: no starts, no limits, no landings. More than 100 missions: pursuit, bombing, patrols, support. Fight on any side: RAF, Luftwaffe or Red Army Air Force. Authentic ranking system: real WWII medals and ranks. Experimental airplanes that could have changed the war.